Prakash Paudel, planning officer at the District Coordination Committee, Chitwan, responds to quake victims' queries at his office in the recent photo. CHITWAN, August 29: Following the devastating April 2015 earthquake, government had announced to aid quake victims in rebuilding their homes. It pledged housing reconstruction grants to help the victims to commence the rebuilding process. 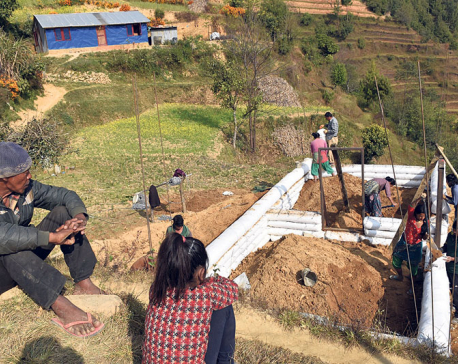 After almost two-and-a-half years since the major jolt, quake victims have been forced to acknowledge a bitter truth - it is not easy to receive the reconstruction grant. The National Reconstruction Authority (NRA), a government body which is responsible for completing the quake reconstruction works, has signed grant agreement with the victims and decided to provide the housing grants in three-installments. However, there are many eligible quake victims in Chitwan district alone who are yet to receive even the first installment of the reconstruction grant. Many such victims can be found at the District Coordination Committee (DCC), Chitwan, querying concerned officials about the time when they will receive the grants. Planning Officer at the DCC, Prakash Paudal has been handed over the responsibility to manage the funds received by the office for quake victims. But as the grant installments have not been provided to the victims, even months after signing agreement with them, Paudel’s office sees queues of victims which complain about the delays on a daily basis. As a first installment of the reconstruction grant, NRA provides Rs 50,000 to the victims who have signed agreement with them. Nathuram Gharti of Bharatpur-29 is one among them. However, he still has not received the first tranche of the grant even after knocking on DDC’s door for at least five times in the last two months. “I had signed contract with the NRA two months ago. Yet, I have not received the grants as the officials point out to one mistake in the process. And though I have tried to correct it, I have remained unsuccessful due to bureaucratic hassles,” said Gharti. His name and surname in NRA contract and the bank account he opened in Agriculture Development Bank matches with each other. However, his surname is different in the NRA’s victim name list although his first name is the same. According to him, people with the caste ‘Gharti’ are called ‘Bhujel’ in his village. The NRA’s name list has his name as ‘Nathuram Bhujel’ instead of ‘Nathuram Gharti’. That simple mistake has cast clouds of doubt on whether or not he would receive the grant. “Yes, even a mistake in surname can create problem in receiving grant,” said DCC official Paudel. Account department of DCC is also not in position to say whether or not Nathuram would be able to receive his share of grant. Not just Nathuram, there are many other victims whose grants have been withheld for one reason or the other. Krishna Bahadur Baniya of Ratna Nagar Municipality-10 is another one. His contract number is 35-33-0-066. Although other victims are not supposed to have the same number, the situation turns out to be unexpected. Another quake victim has the same contract number. Government employees are in loss for what to do next to resolve the issue. As per the suggestion of the NRA, ‘B’ has been added to the end of the contract number to differentiate the two. To claim the grant, the contract number should match in the records of both the NRA and Accounts department of DCC, which has not happened yet. In lack of that, both the victims are yet to receive their reconstruction grants. According to officer Paudyal, such cases of same account number are in hundreds as of now. However, the ever present bureaucratic hassles in the government offices have prevented such victims to receive prompt relief. “I’m completely clueless on when we can get the grant. I’m already tired of visiting Bharatpur back and forth from Ratna Nagar,” said disgruntled Krishna Bahadur, expressing utter disappointment towards lack of willingness among officials to resolve the issues from the authorities. He added that it is completely disheartening not to receive the quake grant even after almost two-and-a-half years of the quake. There are 7,335 victims in Chitwan district waiting to reconstruct their quake-ravaged homes. Among them, only 3,500 victims have signed contract with the NRA for reconstruction. Even among those who have signed up, only 1,453 victims have received bank check for their first tranche of relief. 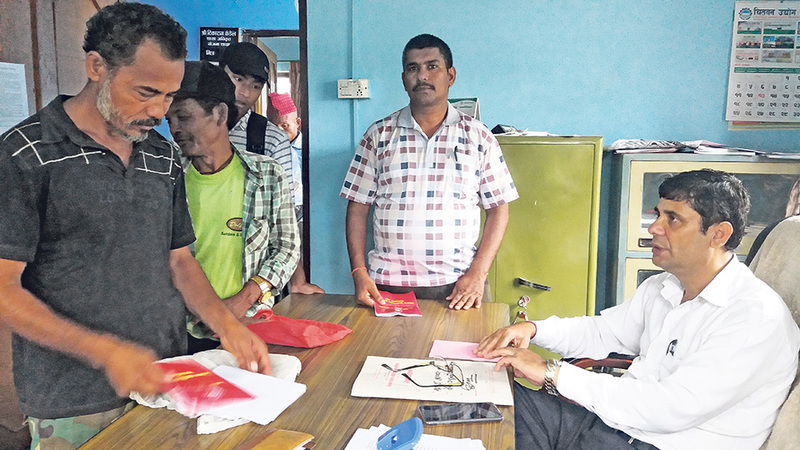 Some of the victims who have received check have complained that they have not been able to withdraw the cash due to some errors, Paudel informed. Such checks have been returned to the DCC.